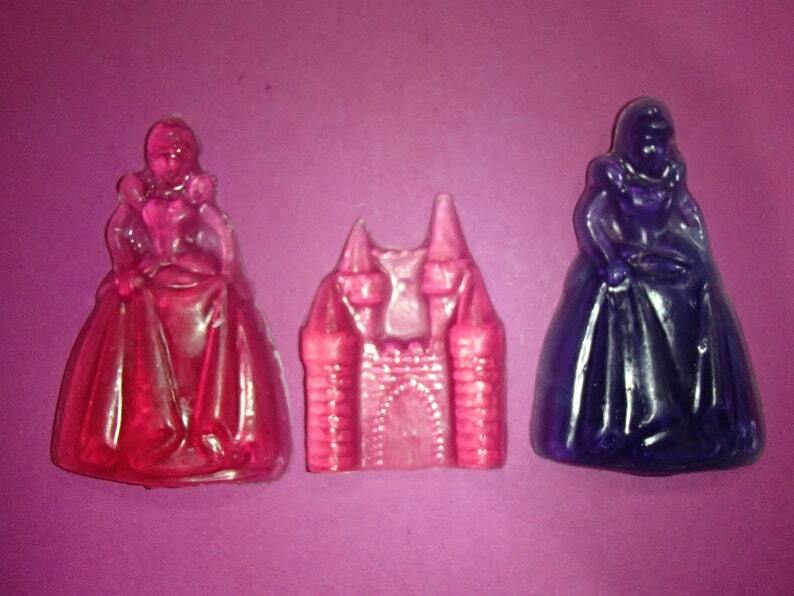 This is a great soap set for those who are interested in princesses and castles, especially young girls. The set includes 2 Princess Soaps and 1 Fairy Tale Castle Soap. The Princess Soaps weigh ~0.5 ounces. Each measures ~2.5 inches in height, ~1.75 inches in width, and is 0.25 inches thick. One is scented Violet and colored purple. One is scented Red Current and colored pink. The Fairy Tale Castle soap weighs ~0.2 ounce. It measures ~2 inches in height and ~1.25 inches in width and ~0.25 inches thick. It is scented Rose and colored pink. I individually wrap and label each soap I ship. The soap was handcrafted by me using the melt and pour method of soapmaking using glycerin soap base, soap coloring, and soap fragrance. Note that since the soaps are handcrafted in small batches the shade of the color may vary some. Contact me if you would like to order a different quantity, a different color/scent combination, or if you have any other questions. I can usually make and ship non-stock requests (i.e. more than the amount I have listed or special color/scent requests) within a few days. Please see my Etsy profile for list of scent options. Adorable and cute!! Perfect for my bowler son!! Will def buy from again!! Love these cute fishing bobbers!! Highly recommend! !